Easter is a time of hope, renewal, and celebration. It’s about looking ahead to the life God has in store for us because of what He did in the past for us. When he died, a debt was paid and God's love was displayed. See why we celebrate Easter and how you, too, can find hope in an empty tomb. 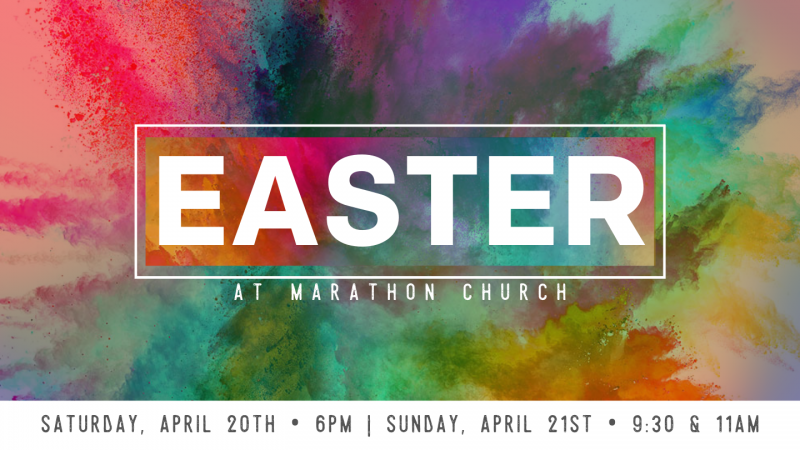 Join us this Easter weekend for a community-wide celebration at Marathon Church as Pastor Eddie Cox reminds us of the ultimate sacrifice that gave us all a hope and a future! Your kids do not want to miss this one-of-a-kind Neon Egg Drop event during all of our Easter services! Neon Easter Eggs will drop from our glow-in-the-dark youth environment with prizes both big and small. Every egg wins a prize! Make sure you're following our Marathon Instagram (@marathonpvl) for prize updates so you have a chance to win the biggest prize of that service!